Is your old 3-tab shingled roof making your home look outdated? Upgrading to architectural shingles can bring your house back to life with better protection against mother nature and enhance its curb appeal. In this article we’ll be discussing the benefits and value of architectural shingles as well as how we can help assist you with the best brands and choices. Want even more options regarding shingles? View these tips for choosing a color and type. As you might expect, upgrading your shingles to a more modern type will provide a variety of benefits. However, before we get into them, let’s quickly cover a few distinguishable differences between 3-tab and architectural shingles. As you can see from the image above, the most noticeable difference is visual, but beyond the trendy look, there are other factors that will benefit you as well. Architectural shingles will last longer than 3-tab shingles. They are thicker and can hold up to higher wind speeds and weather. The warranties are generally longer allowing you to stretch the protection of your roof. Choosing architectural shingles over 3-tab shingles will give you peace of mind knowing your roof is stronger and more durable. With new and cutting edge shingle technology, they can last twice as long as traditional 3-tab shingles. Due to their superior lifespan, you’ll be replacing your roof less often and in most cases, one investment can last you a lifetime. Whether you’re trying to sell your home or just want a new updated and fresh look, architectural shingles provide a more modern and trendy curb appeal. 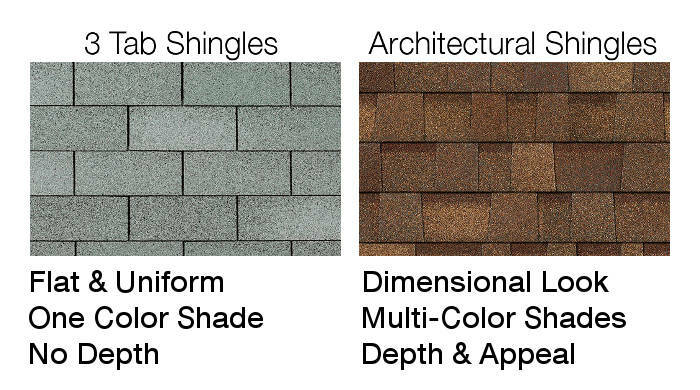 It’s true that most dimensional shingles cost more than traditional styles, but you might be surprised at just how small the difference is! In many cases, clients we assist with storm damage claims find that we can often replace their old outdated shingle with a new modern style at no additional expense. While many manufacturers still produce 3-tab style shingles, their options are becoming more and more limited due to the dimensional styles dominating the marketplace. Whether your home is brick, stucco, wood or vinyl siding, choosing architectural shingles will open the door to many options that will make your roof the talk of the neighborhood (in a good way). When you hear the term…”architectural”, many homeowners will often refer to these as “dimensional” as well. While both are generally considered the same, they also both refer to a modern style. Depending on the roofing manufacturer, all new and innovative “modern style” shingles may vary in name based on their branded terminology. Here’s a few different styles from Owens Corning and CertainTeed. 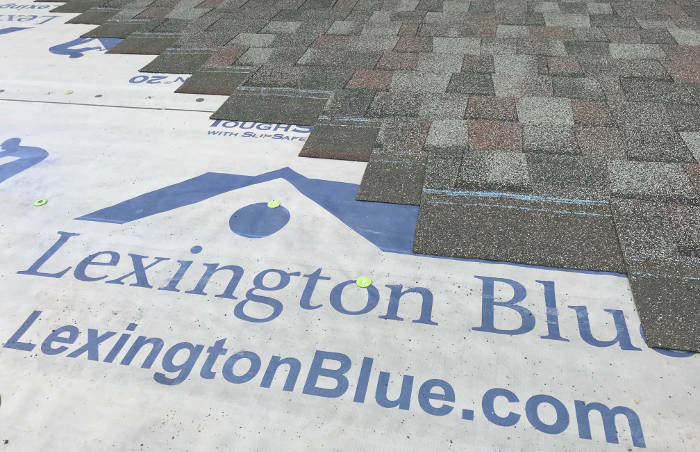 Lexington Blue Can Offer The Best Brands Of Architectural Shingles On The Market! Being the only house on the block with an eye sore of a roof can leave your curb appeal, well, lacking. By having Lexington Blue install architectural shingles, you can achieve a dimensional, more updated and natural look while adding instant curb appeal to your home. Because we are an Owens Corning Preferred Contractor as well as a CertainTeed Shingle Master, we can offer the best from both brands. Our certifications indicate that we have been specially trained on how roofing, ventilation and attic insulation work together to improve your home’s energy efficiency and comfort. This means that no matter the brand you choose, you’ll get a roof installation that’s performed by one of our experienced and knowledgeable crews. In addition to our training and qualified certifications, we can also offer better warranty coverage for either brand of shingle. Top that with our own additional 5 year labor warranty and you’ll have peace of mind knowing your roof was installed by true professionals. When you’re ready to enhance your home’s curb appeal, call or request a free estimate!